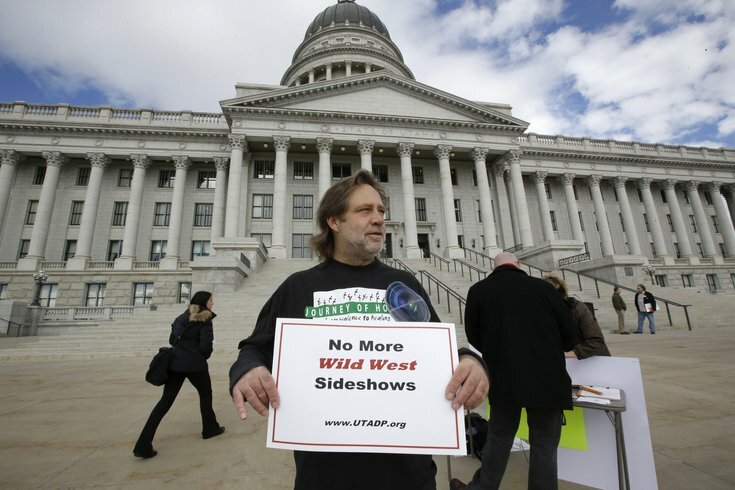 In this Jan. 27, 2015, file photo, Randy Gardner of Salt Lake City, the older brother of Ronnie Lee Gardner, the last inmate to be killed by firing squad in Utah in 2010, protests with a group opposed to capital punishment plans. Lawmakers in Utah voted on Tuesday to bring back the use of executions by firing squad if lethal injections are unavailable, becoming the only state in the nation to permit the practice. Utah used firing squads for decades before adopting lethal injections in 2004. The Republican-sponsored bill, which passed the state Senate on Tuesday, was introduced amid nationwide concerns about the efficacy of lethal injections.